Club Med has introduced its new Amazing Family program that’s available at Club Med Punta Cana and Cancun Yucatan. The new concept includes a fun-filled weekly agenda of activities from five different categories – Time to PLAY, Time to SPLASH, Time to QUEST, Time to RECHARGE and Amazing Family Happy Time. Each category offers families time together. 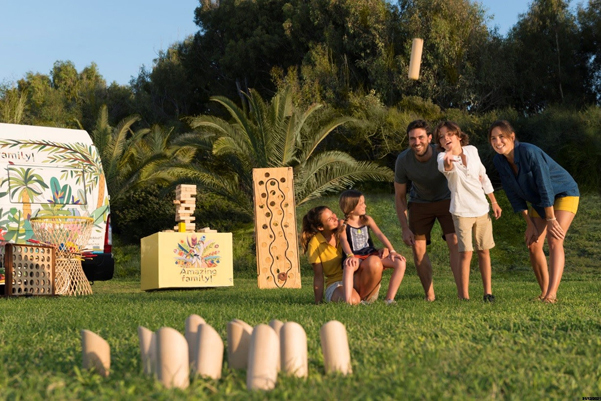 Time to PLAY: Let’s families enjoy playing childhood games – like Bag Board, Mölkky, Pallina and life-sized versions of Twister, Jenga and Mikado – as a group. Time to SPLASH: Is all about fun in the water with games designed to help families reconnect without worrying about who wins or loses. Time to QUEST: Families have the chance to solve a mystery together with the help of Club Med staff as they take you on a digital treasure hunt around the resort. Or try not to get lost by participating in a skill testing and exciting escape game. Time to RECHARGE: Put your feet up and relax in a swinging hammock or unwind with some quieter activities including memory games and family yoga classes perfect for younger children. Amazing Family Happy Time: Have fun with an assortment of family activities to take part in, including entertaining shows, family archery, Olympiads and medal ceremonies as well as dedicated daily family time at the playground with CREACTIVE by Cirque du Soleil. At Cancun Yucatan, parents can take a short break from all the family entertainment and enjoy a relaxing treatment at the recently renovated L’Occitane Spa. While in Punta Cana, families can get caught up in the pickleball craze with an exciting game on one of the resort’s four courts. Pickleball is a paddle sport that combines elements of badminton, tennis, and table tennis. For more, go to www.ClubMed.ca .